Last week’s adventure early chapter books list could not encompass all the early chapter books I have been wanting to recommend lately, so here is one more list. 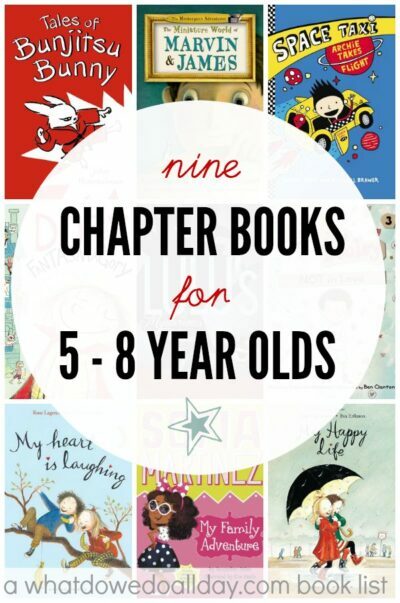 I simply could not come up with a specfic theme for chapter books for 5 year olds to 8 year olds, and so you will have to accept the eclectic-ness of my curation today. If you are new to my series of early chapter book lists (if you’re an old hat, feel free to skip ahead! ), these are titles that are aimed at kids who have graduated from the easy reader stage (Frog and Toad, Henry & Mudge, that sort of thing) but are not yet ready for “middle grade” fiction (Harry Potter, Henry Huggins, etc.). Generally these kids are in first grade and above, but some kindergarteners are ready for these books, too. I became very interested in this type of book because my older son was an early reader so finding material that suited his reading level and was still age appropriate for a kindergartener and 1st grader was a continuing challenge. My parent tips for finding early chapter books may help you in your own quest. Don’t forget! More than 100 of my book lists can be found in the master index of kids book lists. Tales of Bunjitsu Bunny might be my favorite early chapter book yet! (series) It is composed of short vignettes about Isabel (the “Bunjitsu Bunny) and her friends (who also study martial arts). Each clever and funny vignette conveys a zen like lesson without being at all preachy. My 6 year old is very into the idea of battles and fighting these days (Yes, I know!) so he of course wanted me to read a book in which the first action sequence involved head butting a door (they don’t actually get that far…) but I was delighted with the “sneaky” lessons in non-violence, friendship, compassion and self-discipline! Space Taxi. (series) My older son has enjoyed many of Wendy Mass’s middle grade books and this new series is a collaboration with her husband. 8 year old Archie’s dad is an intergalactic space taxi driver! Archie is finally in on the family secret (which still has to be kept hush-hush from his younger sister) and gets to tag along on a “take your child to work day.” Along the way they pick up, and team up with Pockets, a talking extraterrestrial cat who also happens to be an Intergalactic Security Force officer. This is a wonderfully imaginative series and I know we will be picking up further installments as they are written. Dory Fantasmagory (series) had my son in stitches as we were reading it. Dory is a highly imaginative 6 year old. Her older brother and sister invent the Mrs. Gobble Gracker in order to scare Dory into “not behaving like a baby,” but Dory grabs onto the idea and her imagination runs away. It’s hard to describe the whole intricate plot here, but the way Dory’s imaginary world and real world overlap is hilarious. The Miniature World of Marvin and James. (series) If I were to recommend a book about two beetles jumping into a pile of pencil shavings inside an electric pencil sharpener, you might look at me a little askew. Actually the book is about how the beetle, Marvin, spends his time while his best friend (and human), James, is at the beach. Elise Broach’s middle grade book Masterpiece, introduced the duo to the world, and this new early chapter book is a charmer. I also found the text extremely appropriate for early readers. There is a lot of good repetition of vocabulary without being annoying, an interesting and funny story to carry the reader along, as well as good emotional content to help kids connect the story to their own experience. The pencil sharpener incident is simply the most memorable part of the story and the one that my son wanted me to read to him again and again. My Happy Life. (series) I’ve been wanting to share this series about the everyday life of Dani, a young girl starting school. The narration of these Swedish imports is gentle and thoughtful, allowing the protagonist to experience both the small happy moments of life (making friends, finding a place in school) and the sadness (friends moving away, losing one’s mother — years before the action of the story). The overarching feeling of the books is one of balance, but also that children have deep, complex emotional lives. Sophia Martinez is the star of a new series by the author of Zapato Power (… a series that I adore! See it on my list of early chapter books with boy protagonists). This series is at a slightly easier reading level than Zapato Power, with color illustrations and very large type with lots of white space. Some words are Spanish (there is a glossary, but their meaning is easily gleaned from the text). Sophie is an appealingly clever (and not annoyingly sassy, thank goodness) girl who likes to enjoy life, help others and make a statement. Jasper John Dooley: Star of the Week (series). Jasper John is really excited to finally be the star of the week. He has been planning for this special event for what seems like forever! He is taken aback, however, when things don’t go quite his way. The class isn’t fascinated with his lint collection, his family tree contains an imaginary member and his friend’s baby sister seems to be stealing the show. Kids will easily relate to Jasper’s insecurities as well as his desire to be memorable. Ah, what a treasure of a post! All new books for me! I can’t keep up with my 6 and 7 year old and their desire for new books. Will reserve some of these! Thanks! I really want to read Masterpiece, too. I can’t believe I haven’t done so yet! The Dallas Cowboys might take Chad he'll fit right in there with guy who beat on his mother. The Cowboys will be one big happy woman beating family.12:50 AM__________________________________________________That's why they won't take Chad,they have enough bad publicity with Dez and his domestic issues.BTW,DeZ DID NOT beat his mother!!! Stop slandering the Black Man's good name. I always enjoy your lists very much. Have you ever heard of the “Billy and Blaze books”? There are about nine or ten of them. They were written in the 30’s Billy and his horse Blaze have adventures in lost stone quarries and with mountain lions. I teach second grade and have had great success with these books with some of my boys. Also, my school is looking for chapter books with characters that face social justice issues: race, gender, economic. We are looking for a book that could be read aloud to younger children or read to themselves by older children. I wondered if you have any to suggest? It is a tall order, I know. We are not looking for simply diverse characters, but for there to be a problem or issue to discuss. Thanks for any help you can give. I haven’t heard of Billy and Blaze. I will have to look for it. Your request is a tricky one! I know there are books, and I think that would be a good theme for a list so I’m going to work on that one. I do love Christopher Paul Curtis’s books, and they might be good to read aloud to 2nd graders. I think I first read one to my son when he was in 3rd grade. The Jacket by Andrew Clements might work for race issues. Here’s a description: Phil is on a mission. His absentminded little brother forgot his lunch money. All kinds of thoughts are running through Phil’s mind as he searches for Jimmy in the throngs of fourth and fifth graders crowding the school hallway: …if I’m late for math today, then I might not be allowed to take the test — and then I could flunk math! I might even flunk sixth grade and get left back! Then Phil spots Jimmy’s one-of-a-kind jacket and rushes to the corner of the hallway. Except the person wearing it isn’t his brother; it’s some black kid Phil’s never seen before — wearing Jimmy’s jacket! Phil makes an accusation, tempers flare, and both kids wind up in the principal’s office. How will Phil react when he finds out how Daniel came to be the owner of this unique jacket? Will Daniel be able to forgive Phil for an accusation that was based on racial prejudice? What will each boy learn about the other, and most important, about himself? Ah, yes! Excellent suggestion! My son read that last year (3rd grade). I also just checked out a book, Susan Marcus Bends the Rules, which looks like it would also work for you. Wonderful! Thanks for sharing your recommendation. Awesome list! Some favorites (Dory!!) and lots of new titles as well! Thanks Stacey! Dory is so wonderful! One of my favorite books of all time, now.